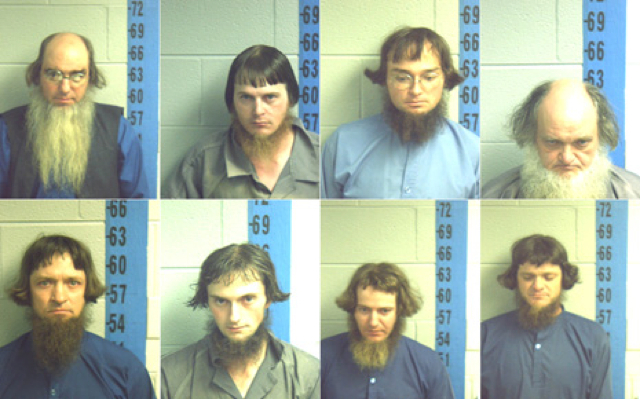 No, they’re not coming out with an gay Amish Brady Bunch. These eight fine gentlemen were jailed for not putting up orange safety decals on their horse-drawn carriages. Their religion bars them from displaying bright colors. I am not making this up. The mug shots of the seven dwarves here are so diverse. Most of them look ashamed. Bottom, second from the left looks like he’s a little curious about what life with his new boyfriend in jail is going to be like. Grumpy on the top right is my favorite though. He looks like he’s placing an Amish curse on the photographer. I have to say I like the beards. If I had the ability to grow facial hair I would totally have one. Wrestling Video of the Week: Um, What?